Watch the Hummingbirds and Butterflies Dance! You'll love the charming bicolored flowery spikes of fiery orange and a hint of blue. And so will the hummingbirds, butterflies and honeybees it attracts. A distinctive addition for any border. 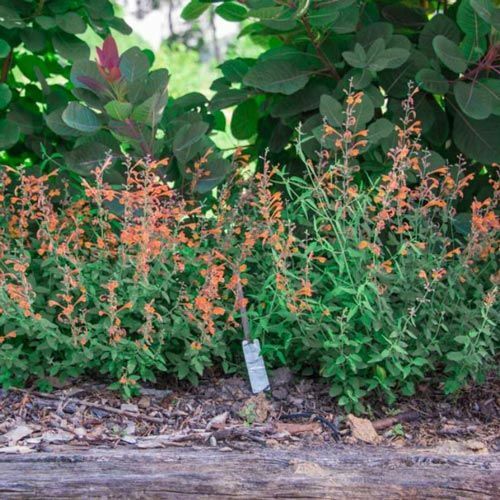 Drought tolerant and easy to grow in any garden soil. Foliage TypeOvate to lance shaped, grey-green leaves. Soil RequirementsWell drained, humus enriched soil is best. PruningRemove faded flowers to prevent seeding. Leave stems to overwinter. Remove new growth in early to mid spring for more flowering stems and a more compact plant. Planting InstructionsSet at the same level as it is in the container. Firm soil and water thoroughly.